Dog bite force or pressure (force per unit area) of a dog’s bite when full closure of the mouth is made may be useful information to have in some dog bite cases. For example, when an attorney needs to substantiate that certain kinds of injuries, particularly blunt injuries, may have been caused by the dog’s bite, or when arguments about dog bite force pressure are used to impress upon a jury the dangerous nature of the dog in question. Frequently various accounts about dog bite force are made from experts stating, for example, that the bite force of a pit bull is in excess of 1500 psi, and pit bulls have the ability to shatter the femur of a cow with a single bite. Many trainers who favor certain breeds (particularly the “bully” breeds, such as pit bulls), and who admire the breed’s prowess, often make unsubstantiated (and often exaggerated) claims about the force of a dog’s bite. Certainly, there are many anecdotal accounts suggesting that some breeds have the potential to bite with tremendous force. Dogs with oversized jaw muscles should exert more pressure when they bite because an animal’s bite force is largely determined by the size of the jaw muscles. However, the exact dog bite force exerted is difficult to determine, and is not known scientifically, despite what an expert might claim. No reliable data exist validating the maximum bite force in any breed of dog, including pit bulls. It is easy to understand why: One cannot simulate (for the purpose of calibrating maximum bite force in a laboratory) the real-life situations that come into play during a dog attack. At any given moment, for example, many variables affect the force with which a dog will bite a person: the dog’s motivation at the time of attack, head and jaw size, medical conditions, the condition and size of the teeth, past training and experience, victim behavior and victim familiarity. Moreover, nothing is known about the dog bite force which correlates with the different kinds of injuries caused by a dog bite (e.g laceration, puncture, crushing type of injury). One challenge is to develop a noninvasive testing apparatus that would accurately measure a dog’s bite force. And once a dog is hooked up to appropriate apparatus and the dog is comfortable with the apparatus, then it becomes necessary to get a dog sufficiently motivated to bite with maximum force. These are difficult problems to overcome. Moreover, depending on the circumstances, dogs have the ability to purposely calibrate bite force (a trait some animal behaviorists referred to as “bite inhibition”), so bite pressure exerted in one instance may differ from the pressure exerted in another instance. Dogs also bite different objects with different amounts of force; for example, biting a piece of kibble versus seizing a ball. Further, there is likely to be tremendous variation between individuals within any given breed in terms of the amount of force they can bite with, thus making conclusions about the likely bite force in a breed of dog problematic. 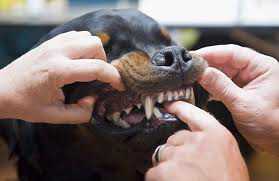 In the only systematic study found in the literature examining bite force in dogs, the authors concluded that behavior variables were probably more important than physical variables in determining maximum bite force. In this study (Lindner, D. Measurement of bite force in dogs: A pilot study. Journal Veterinary Dentistry, 1995, Vo. 12, 49- 52) bite force measurements were obtained in 22 medium to large sized dogs during tug-of-war play games using a rawhide coated transducer rod. Bite force measurements ranged from 3 pounds of force to 313 pounds of force. Three Rottweiler dogs were tested and bite forces ranged between 169 pounds of force to 313 pounds of force. Chewing enthusiasm appear to correlate strongly with the level of bite force generated. In short, statements asserting maximum bite force must be treated with caution, and what one reads about concerning maximum bite force in the larger, more aggressive breeds, may be overstated. Obviously, well muscled, large-size dogs can bite with greater pressure than most breeds, and consequently can easily inflict serious personal injury to a human. Blunt and crush-type injuries are common, and a dog bite with sufficient force to a person’s neck may be fatal.